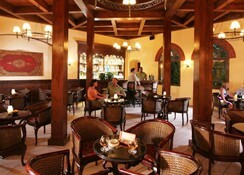 For business or pleasure, when in Hurghada book your stay at the fabulous All Inclusive Sol Y Mar Makadi Sun. This brand new 4 star property is located on the calm, sheltered waters of Makadi Bay, with a private coral reef famous for spectacular snorkelling and diving. 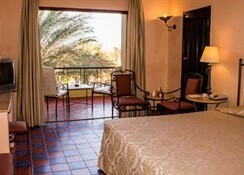 Guests to this award winning hotel can bask in the restful Nubian-Moroccan atmosphere with 145 bright and airy double superior guestrooms boasting modern amenities and delightful garden or pool views. 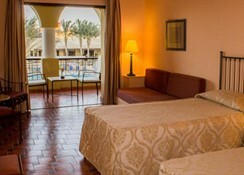 The hotel is minutes from Souk Makadi, the vibrant and bustling shopping complex at the heart of Madinat Makadi, with a range of shops, restaurants, bars and busy nightlife. 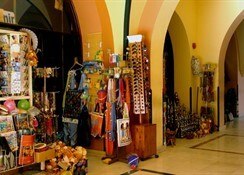 Hurghada International Airport is 30 km from the hotel. 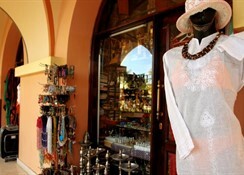 Local Tips: The hotel is in a perfect position for those who want to head offshore for a fascinating diving excursion, explore with desert and dune safaris in a 4 x 4 vehicle or embrace tradition and travel on a camel! Please note: Rates and conditions are only valid for UK passport holders. Food, drink and entertainment: The all inclusive package represents very good value for money and includes full board, welcome drink and afternoon tea with cakes and coffee. 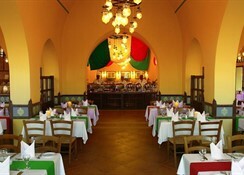 The main indoor and outdoor Bela Luna Restaurant serves breakfast, lunch and dinner buffets, with live cooking stations, and theme nights, the Star Bar Pool Bar offers tropical drinks and cocktails, tea and light snacks, the Sunset Lobby Bar is an elegant venue for refreshing drinks, and the Sunbuco Fun Pub is open to party the night away with a free Billiards table and lots of energetic dancing. There is also a pre-paid “dine around” facility available through reception to dine at six of the restaurants in the Souk Makadi area or at the sister 5 Star Iberotel and Jaz hotels. Live music, dancing shows and cabarets are performed regularly in the evening at the theatre. Sports, games and activities: Sparkling swimming pool and kids pool both heated in winter, shaded poolside areas, sun beds, table tennis, Boccia, Darts, volleyball, archery, table football, games room, on-site fitness centre and spa with sauna and Jacuzzi, Kids club for children aged 4 to 12 with a dedicated animation team, nearby diving centre with private reef, exciting water sports including Parasailing, Waterskiing, Wind Surfing, Banana Boat, Catamaran, Kayaking, Knee Boating, and Waking Boarding (private operators, some activities with charge). From May 2011 guests staying at the Sol Y Mar Makadi Sun will have unlimited access to the new Makadi Aqua park featuring 46 slides a 280m long lazy river and a wave pool. A free shuttle bus is provided at set times throughout the day. Additional: 24 hour reception and concierge, telephone and fax services, 24 hour doctor on call, porter service, laundry facilities, 24 hour shop, babysitting service, car parking (may be charge), car rental, travel agency facilities. 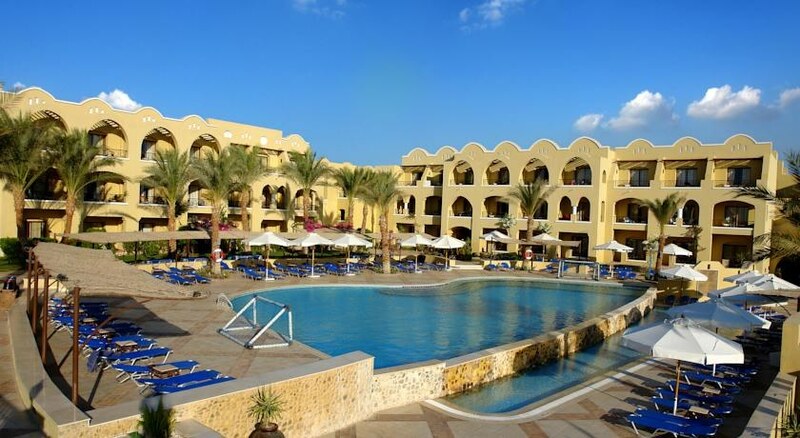 The Sol Y Mar Makadi Sun features 145 tastefully furnished double superior rooms, many with connecting doors and all with a balcony or terrace and a delightful pool or garden view. All rooms are individually air conditioned and fully equipped with private bathroom and shower cabin, hair dryer, Satellite TV, international direct dial telephone, mini bar, and safe deposit box (available at reception). Non-Smoking rooms are available on request. Please note hotel will be closed for general renovation from 18.01.2018 – 30.04.2018.